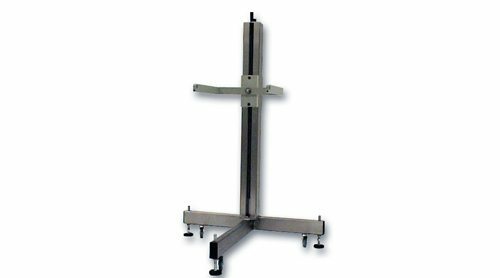 The T-Base Stand is a heavy-duty, one-piece construction base. It has the capability for vertical adjustment, and is complete with a U-Arm, casters, and leveling pads. The standard height for the T-Base Stand is 48″. Options include horizontal adjustment and stainless steel construction. Quadrel also offers an oversized H-base with breakaway feature for pallet labeling.